It suggests that the selves we are online aren’t authentic, and that the relationships that we forge in digital spaces aren’t meaningful…. This sort of stunt presents an experiment, with its results determined beforehand; one finds exactly what one expects to find: never more, often less. It’s one of the reasons that the unplugging movement has attracted such vocal criticism from the likes of Nathan Jurgenson, Alexis Madrigal, and Evgeny Morozov. If it takes unplugging to learn how better to live plugged in, so be it. But let’s not mistake such experiments in asceticism for a sustainable way of life. For most of us, the modern world is full of gadgets and electronics, and we’d do better to reflect on how we can live there than to pretend we can live elsewhere. Whether one calls them digital detoxes or just taking a break they are often used as a means to announce something determined to be defiant to the world. A “Look at me! I’m a rebel.” kind of narcissistic gesture. About as useless as turning off your lights for an hour on Earth Day. A symbolic gesture that is meant as a feel good palliative and is forgotten the next day. No questioning of why one is plugged in (communicatively or electrically), the larger implications of the consumption of media and it’s infrastructure, or the privilege of being in the position to actually turn these things off and post a posed selfie, with hand drawn sign, the next day indicating another uptick of fake social awareness and in-group cultural capital. “Always be maladjusted” — Most powerfully, Martin Luther King said: “There are some things in our society, some things in our world, to which we … must always be maladjusted if we are to be people of good will. We must never adjust ourselves to racial discrimination and racial segregation. We must never adjust ourselves to religious bigotry. Here is his full speech King’s challenge to the nation’s social scientists on the APA website. I broadcast a few links that were less than flattering about Aung San Suu Kyi. Someone felt it necessary to take me to task about that. Now I’m grateful that there are people in the world who stand up against injustice and people who are willing to sacrifice their lives via imprisonment or worse for that. World would be much more horrific than it is without resisters. Resisters, dissenters and rights fighters are still human though. Still with human motivations, political considerations and so forth. Elevating them to godlike or celebrity status clouds the issues, removes focus from what they represent, doesn’t allow us to see their human failings…and they are very much human and ultimately can lead not only to huge disappointments but even backlashes against both them and their causes. 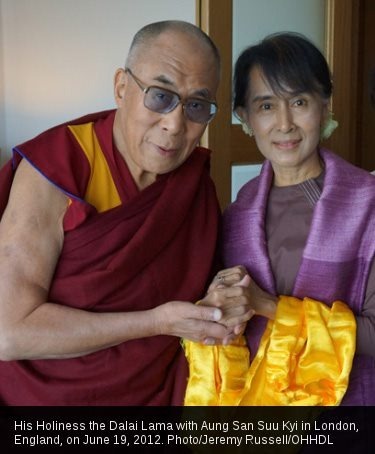 Aung San Suu Kyi, the Dalai Lama, Gandhi, MLK and so many others are as much politicians as activists (in some cases literally). It is necessary, especially for movement leaders, to not only understand the political climate in which they are trying to effect change but to have the savvy to effect that change. Sometimes that means political maneuvering, leveraging other, less savory elements of the political landscape and consorting and compromising with those who may be diametrically opposed to their ends. It can be a very ugly business behind the scenes. So before people jump on me for harshing the mellow on the superstars consider the bigger picture. The spotlight only shows a very small and particular moment of their entire lives. For the past few days I’ve watched the discussions of many members of the Buddhist community in the United States, Canada and Europe about events happening in Burma regarding the persecution of a particular Muslim minority. Like all situations of oppression and persecution there are many nuances and complexities that are often lost in the media. History, colonialism, geography, group loyalties, language, culture, tribalism, economics, politics and religion are some of the primary factors within such complexity. It was suggested that a statement from this self-assembled Buddhist group be forthcoming on the issue. I am one who thinks stating one’s position on an issue is a good idea, particularly if that issue involves oppression and asymmetrical power relationships. A few concerns cropped up for me initially, in that it can be a delicate thing for a primarily well-off, primarily white, primarily male group to condemn events in which they are not directly involved half-way around the world. You know what I mean…imperialism and all that jazz. Fortunately initial impulses gave way to broader context and more reasoned thought and the document signed and released covered the broader spectrum of Islamophobia in general. It also did not focus exclusively on events in Asia but brought some amount of cultural self-scrutiny along with it. This is a good joint effort and kudos to the group for taking a public position.